Universities that contract with an online program management company tend to outperform those that go it on their own. OPM providers may offer end-to-end services for online programs, including marketing, recruitment, course design, enrollment and retention; examples include Pearson Embanet, 2U and Academic Partnerships. Or they may focus on a specific vertical, such as healthcare education, or type of service, such as instructional design. 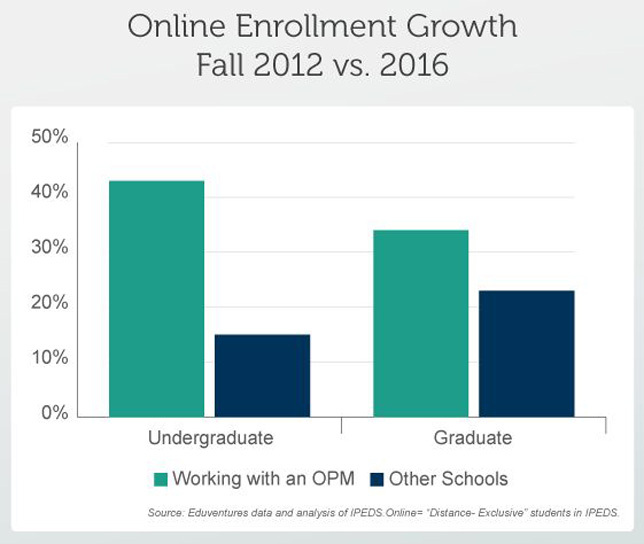 Research by Eduventures has found that on average, schools working with OPMs have seen a five-year online enrollment increase significantly above that of peers: 43 percent vs. 15 percent at the undergraduate level between 2012 and 2016; and 34 percent vs. 23 percent at the graduate level, during the same period. According to "Expanding the OPM Definition," available to members of the National Research Center for College and University Admissions, the OPM market is evolving with new financial models and development of unbundled service tiers. Traditionally, the report noted, OPM companies have signed long-term contracts with schools, incorporating investments in new online programs. They recoup their investments via revenue-sharing agreements. Now, hybrid and limited models have surfaced to offer fee-for-service terms, enabling institutions to retain control over their enrollment revenue. "Some OPM schools have super-charged online enrollment — well over 200 percent — while others are flat or declining," explained Richard Garrett, Eduventures chief research officer at NRCCUA, in a company article about the research project. "Numerous factors, such as institutional commitment, market maturity and program quality, affect enrollment, not just the presence or absence of an OPM." As he noted, the market continues to grow and evolve. "Moreover, as online learning continues to [go] mainstream, more schools may decide the modality is a core business and worry that an OPM might limit institutional capabilities long-term. When judging an OPM, it should also be noted that enrollment is not the only metric that matters. Student engagement and outcomes are just as important." NRCCUA is an educational data science and research organization serving more than 1,800 member institutions, including public and private colleges and universities. Eduventures is a division of the company.